Judy Blake by Jonathon Bancroft Snell. Frye Canadian Ceramist Collection. Congratulations to Judy on a recently published book, titled “Judy Blake”! 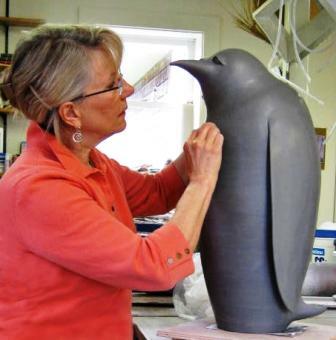 Written by Jonathon Bancroft-Snell the book describes the evolution of her ceramic birds as well as her trajectory from functional potter to ceramic artist to sculptor. The book is available from the Jonathon Bancroft-Snell Gallery in London, ON ( 1-519-434-5443) or from Botinicals in Fredericton, NB ( 1-506-454-6101). Also, look for Judy’s page on this website in the early new year. This entry was posted in Ceramics, Contemporary, New Brunswick and tagged Judy Blake on November 25, 2014 by Barry Morrison.